We thoroughly enjoyed our half day tour of Kumamoto with Kiki. She was very informative and flexible with our tour. Her passion for her hometown shines through and her suggestions as to where to visit and eat were appreciated. I highly recommend Kiki for anyone looking to save time and get the full value out of visiting Kumamoto. Her help with family registries sets her apart from any other tour guide; if you have relatives who have immigrated from Kumamoto, there is no one else we would recommend. Ikue was a great guide for our visit to Kumamoto and Aso area. Her English is very good and she explains things perfectly. She is well organized and very polite and friendly. We highly recommend her services. ikue has been the most welcoming, accomodative and informative guide! we had a very relaxing and enjoyable time at mt aso, the gorge and other sights along the way. the driver made the trip extra pleasant and comfortable as well! big thank you to both of you! Ikue was our guide for a day trip from Kumamoto to Mt. Aso. Her knowledge of the area was quite extensive and her English was excellent. She came well prepared with maps, stories and pictures to augment her descriptions of what we were seeing. We stopped for a couple of sites we would never have found ourselves. It was Avery enjoyable day. Ikue is an incredible guide. She shared a wealth of information with us, conversing in English fluently. Her efforts included arranging an excellent driver and tour vehicle for our tour. She put together an amazing tour package that included an opportunity to visit the location where my grandparents resided. Our family can't thank her enough for helping to make our Japan experience so meaningful. This tour by Ikue was my favorite out of our two days together (both tours were great though). Since Kumamoto Castle was damaged in a 2016 earthquake, Ikue added Miyamoto Musashi's Reigando Cave to the tour and is totally worth the effort to get there. Two days is hardly enough time to see all of Kumamoto but Ikue's tour will give you wonderful memories for years to come. If your travels take you here, hire Ikue. It'll be one of the best decisions you make on your trip to Japan. Absolutely fabulous tour! Ikue is an extraordinary guide who's very quick to read a guest's needs and is always happy to adjust the tour to your liking. The tour of Mt. Aso was very informative and Ikue was always able to answer any of my questions. Ikue was my first tour guide on my month-long trip through Japan and I'll consider myself blessed if the rest of my guides are half as wonderful as her. Wonderful tour by Ikue who was very engaging and knowledgable! She also took pains to ensure that my elderly mother, who was travelling with me, was comfortable with the pace and Ikue always kept a lookout for her in terms of safety. Our second tour with Ikue which is as fantastic as the first one (Takachiho day tour). Weather determines what you can see on this tour and we were blessed with pretty nice weather. We started the tour in Kumamoto but we're staying in Kurokawa after the tour. Ikue arranged to drop us off at our ryokan and let us end the tour in Kurokawa instead of returning to Kumamoto. Without Ikue, we couldn't have visited all the places we did. Highly recommended! Absolutely fantastic! Ikue speaks fluent English and is very attentive to our needs, from water break to motion sickness. I requested to take the Amaterasu railway and Ikue made it happen without sacrificing anything else. If you have time, consider booking two tours. You won't regret it - we enjoyed every moment of our tours! Special thanks to the driver who bought boat tickets for us when we're enjoying our walk on the trail. We loved our tour with Ikue. She was so accommodating and lovely for our group of 10 ( 2 elderly, 1 child and 7 adults). From helping us with the car/microbus rental to going over what Kumamoto has to offer, and giving so much information about the area and the caldera, even bringing a 3D topographical map of Mt Aso region! 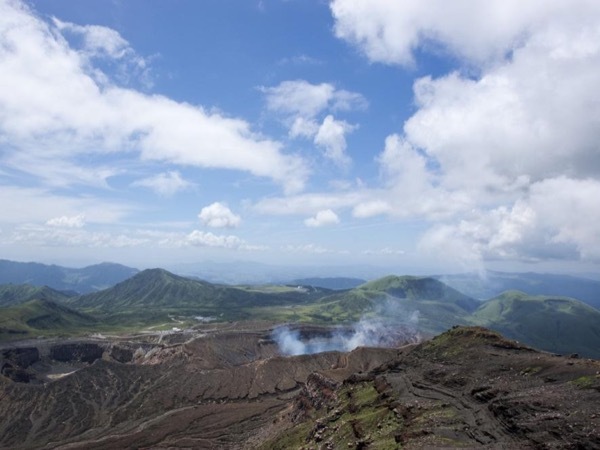 When Nakadake crater closed, she accommodated with changing the itinerary. Our family loved our excursion with Ikue, and I don't know what we would have done without her! We could not have discovered all the wonderful places in Kyushu without Ikue's well orchestrated itinerary! Highly recommend. We definitely got more than we expected due to her expertise in tracking down our family roots in Kumamoto including finding relatives to meet. Very knowledgeable and gracious. Thanks much. This tour was great! Ikue guided us to Takachiho Gorge and the surrounding area and explained the history. The gorge is beautiful by boat and from a distance. We also stopped at scenic places along the way, which was a nice experience. A very memorable tour. Thank you Ikue! This is a long-overdue comment. Ikue was incredible. We thought we would not be able to locate any of my relatives, but she was able to locate my second cousin. Up until the day before the tour, Ikue did not give up and was determined to find my relatives. What a blessing to find my second cousin that I thought I didn't have! We went to his home and met his kind family who showed omotenashi. I will never forget this experience, and it was the best trip of my life. Thank you so much, Ikue! An exceptional guide! Ikue-san was extremely professional, knowledgeable, and diligent in helping find our family roots. Through her expert research before we arrived (many email exchanges! ), we secured our family records, had a wonderful meeting with our relatives at their home located on the family land where our grandfather came from, and placed flowers on the graves of our ancestors. She goes above and beyond what is required and does so because she cares. Highly recommend Ikue-san. A memorable tour! Our 2nd tour with Ikue: Aso was spectacular, the highlight of our whole trip. Weather conditions determine what you can see on this tour; fortunately, we had good views of gorgeous mountains, verdant rice fields, and pristine waterfalls. We stopped at a market where we sampled the delicious award winning local dairy products. Ikue arranged visits to hot springs, waterfall, and caves, again via private taxi. Another glorious day! Ikue also gave us helpful advice for other days of our trip. Domo arrigato! Ikue met with us prior so she could tailor our tour. We had a lovely trip to Takachiro Gorge and surrounding area. Ikue arranged a private taxi and planned visits to other local areas of interest. She was knowledgeable about the culture, history and geology of the sites. She was professional and helpful. Since we booked a 2nd tour with her for the following day, she suggested we consider staying overnight in the area. That gave us time to relax and enjoy everything more. We had a delightful day! Ikue is very friendly and very willing to share. She speaks pretty good English too. The driver was nice too. Excellent explanation of the history of the places we visited. The listing also clearly states that the Tour Price is excluding the Driver's fee of which we were aware. The driver's fee is approx 25,000 - 30,000Yen which is pretty reasonable for the long drive and whole day use. TOUR GUIDE RESPONSE: Adeline, Thank you very much for your good review on the tour. I hope you enjoyed one day Takachiho/Aso tour. Within the limited timeframe, you visited the highlights of the areas. Also, thank you for mentioning the taxi fare. I am afraid that it costs a lot for my clients, but I am glad that you found it pretty reasonable considering the long drive. I will convey your message to the driver. Perfect Tagachiho and Mount Aso tour with Ikue. Ikue was perfect in showing us the most in the limited time we had. Ikue was very thoughtful and gave us all the attention so we could enjoy all the little experiences everywhere we went. As we wanted to proceed to Beppu, Ikue suggested departing from Aso Station and the little train from Aso was the perfect finale. The sight seeing is amazing. A note also to our driver who was also very attentive and patient, waiting and picking us up in the right spots. My grandfather was from Kumamoto and my father has always dreamt of seeing where his dad grew up. We had minimal information and no idea where to start. With Ikue's guidance and her tireless efforts we were able to obtain our family koseki, visit with a relative, stand where my grandfather's house used to be, see our family grave site, visit the family temple and spend time with our family minister. We cannot thank Ikue enough, she has given us such a wonderful gift and we will never forget her kindness. Ikue took a rainy day in Kumamoto and adapted it into a productive, informative, and fun-filled day. Ikue is very knowledgeable of the sights and places in Kumamoto. She knows the facts, history, and will take you to places to experience the culture of the people. She even pulled out of her bag a 3-D map of Mt. Aso. She uses a folder of visuals to help explain the sites, and she also provides options of different sites to visit. An excellent teacher and guide. WOW! Ikue is an exceptional guide. It was because of her diligent efforts we found, contacted, and met our living relatives in Kumamoto. She is an excellent communicator in English and Japanese between family members, the koseki, and govt. officials. Families are important and Ikue helped us to find ours. Ikue was extremely prompt replying to our emails and designed an itinerary that suited all of our requirements (party of 4). Ikue picked us up and dropped us back directly from/to the cruise terminal in a private car (great driver, very clean). Ikue was extremely prepared, professional and adaptable, she adjusted itinerary, made bookings on the fly as we wanted to add items. We did a lot in 1 Day. Ikue is very friendly, an excellent communicator with great knowledge of Kumamoto. WE HIGHLY RECOMMEND! Highly recommended. Kobori-san is extremely patient before and during the trip. She was extremely thorough in introducing the history and highlights of the attractions. Our schedule: Kumamoto > Shirakawa Suigen > shochu brewery (takachiho) > Takachiho Gorge (boat ride) > Amanoyasugawara > sake brewery (aso) > South Aso > Aso We visited plenty of scenery spots and were able to make the best use of our time because of Kobori-san's directions. We definitely recommend this tour! This was the best tour we have ever had. Everyone had a great time, including my 91 year old father. Ikue did such a great job helping us get our koseki now we'll have the information forever. I wish we could've done more with Ikue on this trip, she is so knowledgeable and thoughtful, we will definitely try and see her again sometime in the future. I would highly recommend her services without any hesitation, I believe she went above and beyond what was expected of her. Everyone agrees 10 out of 5 stars! Ikue provided a long day's adventure to Mt ASO, the nearby lookouts, village markets and a soba lunch in a family restaurant. She was good company, full of information and entertaining. It was a long day but she made it worthwhile and finally escorted us to the right train. We had come from Nagasaki early in the morning so it was a long day, but very worthwhile. The weather was kind so we had a good view of the volcano. Ikue went above and beyond to make our tour a lovely one. Unfortunately we experienced rain and were unable to see Mount Aso but she offered alternatives instead and made the best of our day. She was extremely informative about the history of Kumamoto and made surprise stops along the way for us to see other attractions. She even rowed the boat for us in the rain when we visited Takachiho Gorge! I loved every minute with her and will hire her again when I return to Kumamoto. Thank you Ikue! Ikue K. created a custom itinerary from the Kumamoto tour booked as our ship docked late. She is a delightful host who treated my family with care and courtesy. We hiked Yatsushiro Castle - Edo Period (1603-1868), toured shoyu and soju manufacturing plants, saw a haunted home, visited Hitoyoshi Ryokan Inn for 5-star lunch, furo bath, Aoi Aso Shrine (青井阿蘇神社) then a scenic drive back. I highly recommend Ikue for her gracious hospitality and historical knowledge. Ikue was an excellent guide who customised the tour exactly to our needs.She went above our expectations by orgainsing our travel next day. Her standard of English was exemplary. Ikue did a fabulous job taking us around Nagasaki. We had two young children with us (9 and 5) and she did an outstanding job both guiding them and helping them approach the very difficult topic of WWII (and the nuclear bomb). Her knowledge was outstanding, and recommendations were perfect. We thoroughly enjoyed the tour and would recommend it to anyone in Nagasaki. TOURSBYLOCALS RESPONSE: ToursByLocals are committed to quality customer experiences and take all feedback seriously. We appreciate any learning opportunity to improve the quality of tour experiences and we have taken necessary action to address the issues raised by this rating. Ikue was INCREDIBLE! Not only did Ikue provide a wonderful tour of Kumamoto, she researched my family, drove an hour to their home to let them know I was looking for them, and arranged to introduce me to my relative at his home. It was the most incredible day. Ikue is 100% heart, goes over and beyond to make the ancestry tour fulfilling, it gave my group goose bumps to experience it and my family and I will now keep in touch. Thank you very much Ikue, you are a gem! A highly recommended guide. She thought about everything for you from a to z. Prepared small gift for my kid, buying local snacks for us to try, even helping us to throw rubbish (as its very hard to find rubbish bin in japan). She made us felt welcome and wanting to come back to Japan again. Her local knowledge, her tour arrangements were top notch. Whether if its your first time to Kumamoto or not, i think she would be your top guide choice. I would again recommend this guide. Period. Ikue's service is top notch starting from prebooking inquiries to conduction of the tours. Because we were first time visitors to Kyushu we had a lot of questions and Ikue was always punctual and patient in addressing all of my questions and concerns. She helped me with many of my pretour questions, and even made many excellent suggestions for me. She met us punctually at our hotel in Kumamoto and led us on two tours. She arranged airport pick up service to make it so convenient for us! This has been a great experience for me. Kiki brought with her a huge amount of knowledge about the area she is from. Very interesting!!! Highly recommended for a fun and educational time. Wonderful and fun day. Very knowledgeable and friendly. Her history of her city and her tour is extremely thorough. I would recommend! TOUR GUIDE RESPONSE: Thank you very much for your comment. I am very glad that you enjoyed the two main landscapes of the city, and had a chance to see special exhibitions of Kiyomasa Kato and "Bonseki." Ikue went out of her way to make our search for our ancestors very fruitful. She did a lot of research before our arrival and drove us many miles to visit them. I would highly recommend her for any reason when visiting Kumamoto. Ikue is an excellent tour guide with a good command of English. She organised a very good itinerary for our group and her commentary was comprehensive. Members of the group were very happy with the variety included in the tour, the lunch and the overall cost. I would recommend Ikue for any tour group in the Yashimito area who require an Eglish speaking tour guide. Mike S.
Very well planned and helpful! Highly recommended! Our tour guide is really friendly and insightful. We learnt a lot about the Japanese culture from her and we would recommend her to our friends in the future. We toured with Ikue for 3 days seeing some of the lovely sights in and around Kumamoto. Ikue was very helpful in her communications before the trip, responding to our interests, and developing itineraries to suit. Before our trip, and at her own initiative, she also communicated with our hotel and car rental company to ensure that we got the best deal. Ikue's English is excellent, and she is very well prepared with background information and maps in folders. We were so pleased to get to know Ikue. This was a custom family history tour. The goal was to visit the family sites of two ancestors in two different villages in Kumamoto-ken. The addresses of the residences were known. We wanted to see where they lived, visit their temples and their cemeteries. We didn't start out knowing if there were any relatives still living in the area. Kiki not only found where they lived but arranged for meetings with relatives and the minister at the temple. The tour couldn't have been better. Thank you Kiki. We highly recommend Ikue K as a guide in Kumamoto. She customized the one day tour to accommodate our large party. Besides the Kumamoto Castle. Suizenji Garden and Reigando Cave, we were able to visit Musashi's grave. Ikue san was born and raised in Kumamoto and her knowledge of the subject areas goes beyond what one can research. She is such a nice and pleasant person and made our tour a memorable one. I would like to commend ikue for a very comprehensive and nice tour, she even take the extra effort to bring snacks for the kids and fruits to taste for us. Am hiring her again !! Guided by Ikue-san , I have travelled to Takachiho gorge and its surroundings, as well as to Kumamoto castle.Takachiho is said to be a power spot. And so is Ikue-san: an energetic woman who is even able to effortlessly move up/downwards the steep stairways of Kumamoto castle.Some of the deities of the region seem to have supernatural powers. I wonder if anyone of them is endowed with the ability to read minds, as Ikue-san did it when she anticipated many of my necessities. She's an attraction apart. Wonderful tour, very individual and customized. Ikue is a very knowledgeable and great tour guide. Highly recommended by us!!! If it is possible to rate Ikue with more than 5 stars, I will not hesitate to do so.For someone who is fairly well travled and have met an arrary of tour guides, Ikue's efficiencies, her care for her guests are apparrent right from my initial enquiries, her patience and the abilities to cater for the guests needs were also unprecendented. In addition, she is highly knowledgeable in the history and sociology,I highly doubt that there is anyone else in the proximity who is able to surpass Ikue, lucky us! Ikue is a fantastic and patient guide. Came by JR and were met at the station where she gave a useful itinerary. The Hosokawa Gyobu-tei House and Suizenji Jojuen Garden were great but the highlight was Kumamoto Castle. This is an impressive place and not crowded with tourists like Osaka Castle. We took our time exploring without feeling rushed. Reigando is well out of the city but the sense of history is evident. You owe it to yourself to visit Kumamoto and letting Ikue be your guide. You won't regret it. Guide was well prepared and researched what we wanted to accomplish with our custom itinerary. She was very accomodating with our last minute tweaking of our plan for the day. We were impressed with her efforts, responsiveness and professionalism and would recommend her without hesitation!